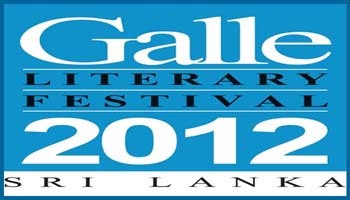 As Sri Lankan journalists and media persons committed to media freedom and to the freedom of expression and opinion in Sri Lanka and in the world, we reach out to welcome all of you who have gathered here, in Galle, in January 2012, to participate in the 6th Galle Literary Festival, which is well known as a space for intellectual dialogue and creative exchange in the fields of literature, arts and culture. We want to draw your attention to the fact that the month of January, in which we are celebrating the arts and culture here in Galle, is also a month which is marked by many of us with various acts of commemoration and mourning. It was in January 2007 that Sugirtharajan, a photojournalist in Trincomalee, was shot and killed for having published the photographs of five students who had been excecuted by the security forces. In 2009, Lasantha Wickrematunge, the editor of the English weekly the Sunday Leader was shot and killed while on his work on January 8. In January 2010, cartoonist and writer Prageeth Ekneligoda, was abducted. In none of these cases has anyone ever been prosecuted. During the years in which the government of Sri Lanka was engaged in a war against the Liberation Tigers of Tamil Eelam (the LTTE), the government also launched a war against the media and against the freedom of expression. Through formal and informal censorship and through attacks and intimidation, they have silenced the diversity of opinion in our country. The prevailing climate of impunity has created an environment in which self-censorship has become the norm. The role of the media in building a strong body of conscious citizens, which is a cornerstone of any democratic society, is undermined. In the last six years, close to 40 media persons have been assassinated. Many more have been subject to brutal assaults. Five media institutions have been destroyed by arson attacks. Many newspapers have closed down. Access to websites has been blocked. Those who challenge this situation are regularly attacked and vilified in the media, both state-owned and private. There are no credible investigations into any of these incidents. Over fifty media persons have fled the country as a result of this situation. The final report of the government’s own Lessons Learned and Reconciliation Commission, which was made public in November, calls for investigations into attacks on journalists and reminds the state of its obligation to ensure freedom of expression, opinion and information. As you enjoy an environment in which you may discuss matters of literature and the arts in relative comfort and freedom, we appeal to you to recall the reality of our situation, and to engage with it in your discussion forums. 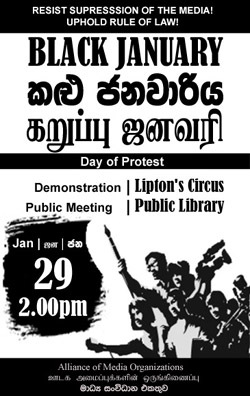 Support the freedom of expression in Sri Lanka in every way that is open to you, here and once you have returned to your homes. Give our message wings to fly with so that our appeal for media freedom and the freedom of expression in Sri Lanka will echo around the world. Colombo additional magistrate Kumari Abeyratne yesterday (Dec. 11th) permitted the withdrawal by the Bureau following advice by the attorney general. A case was filed against the director on the instructions of the AG under Clause 286 (B) 1 of the Penal Code. When the additional magistrate took up a motion, Sergeant Priyanthi of the Bureau said that deputy solicitor general Jayantha Jayasuriya, on behalf of the AG, had informed them of faults in the charge sheets. The matter will be taken up again on January 18th. The editor of a state-run newspaper in Sri Lanka was sacked on Tuesday after it carried derogatory remarks by the Sri Lankan army chief against some Tamil Nadu politicians sympathetic to the Tamil cause in the ethnic strife-torn island nation. Dinesh Weerawansa, the editor of the Sunday Observer, has been replaced on Monday by Jayatilake De Silva, sources said today. De Silva is a former editor of the paper. When contacted, a high-ranking government official refused to confirm whether the removal is linked to the outcry in India following army chief Sarath Fonseka’s comments which were published in the paper on Sunday. Fonseka had said that the Indian government would never influence Sri Lanka to restore the ceasefire with the Tamil Tigers and it would not listen to the “political jokers” of Tamil Nadu whose “survival depends on the LTTE”. “If the LTTE is wiped out, those political jokers like (Tamil Nationalist Movement leader) P Nedumaran, Vaiko and whoever who is sympathising with the LTTE will most probably lose their income from the LTTE,” he was quoted as saying. India today said it has lodged a protest with Sri Lanka over the remarks and Colombo has expressed “regret”. Nov 16, 2008 (LBO) – A Sri Lankan journalist who had been detained for over eight months had been questioned about what he wrote, and had also revealed to court that he had been repeatedly threatened, a media report said. Senior journalist J S Tissainayagam’s case had been taken up Friday in Colombo High Court but the judicial medical officer summoned to give evidence was not present, The Sunday Times newspaper reported. Earlier in the week Tissainayagam had testified that he had a serious eye condition, where an accident when he was 18 had caused a detached retina in both eyes and he had 50 percent vision. Doctors had advised him that a blow to the head could make the condition recur. He said officers of Sri Lanka’s terrorist investigation division who was holding him had threatened him saying he would be “beaten up like other detainees” and that he would go blind if the officers beat him, the report said. He said he was threatened on a daily basis. In cross-examination, a government lawyer had produced several documents and statements that. Tissainayagam was said to have signed on March 7, the day he was detained. Tissainayagam had denied that it was his signature on the documents, saying he signed in the English language and therefore the signature on the documents could not be his. Tissainayagam had told court on May 9 after he had seen another arrested colleague being tortured, and had been told the same would happen to him. The prosecution’s position was that he was lying, the report said. The defence had asked for a medical officer who had reported on it to be called to court. A government lawyer had questioned whether he had visited a Tamil Tiger controlled area with the permission of the Government and questioned him on an article he had written in November 2007 and asked him to read out portions of it. Tissainayagam had read out the article and said he stood by it and added that as a journalist he had expressed his views, The Sunday Times said. The International Federation of Journalists (IFJ) had launched a campaign to free Tissainayagam saying it was a trial on the freedom of expression.